If you are not a Jedi, but do enjoy a cold beer, you may want to check this out. 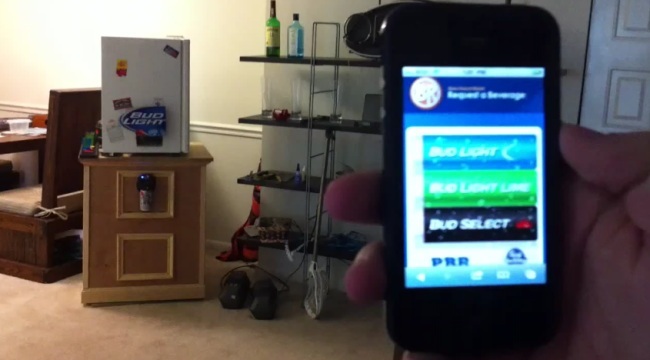 Ryan Rusnak, a 25 year-old Virginia Tech graduate, and some friends have invented something we could all use: an iPhone controlled beer launcher called the BeerBot. The device is a dorm-sized refrigerator and table that allows you to select what beer you’d like and then tosses it to you, reports Asylum. Where can we buy one? The device, which would have handily won best of show at CES should it have made an appearance, uses an iobridge 204 micro controller to connect to an iPhone app that allows you to choose a beer, aim the machine, and then fire. The machine uses compressed air to fire a can across the room at 50 psi. The fridge can hold four types of beer and uses a webcam for aiming. It can also tweet every time it tosses a beer. It took the Rusnak and his friends more than three months to get the beer vending machine and cannon working, but he claims it was totally worth the effort. Now all we have to do is get these kids to drink better beer.